Last week, my family and I spent an amazing 56 hours in New York City – for those of you doing the math in your head right now, we arrived on a Saturday morning around 10am and departed from LaGuardia on Monday evening around 6pm. Typically when a mom, dad and three kids pack up to visit NYC, it’s a vacation, right? This wasn’t just any vacation, it was more like a fun work trip. 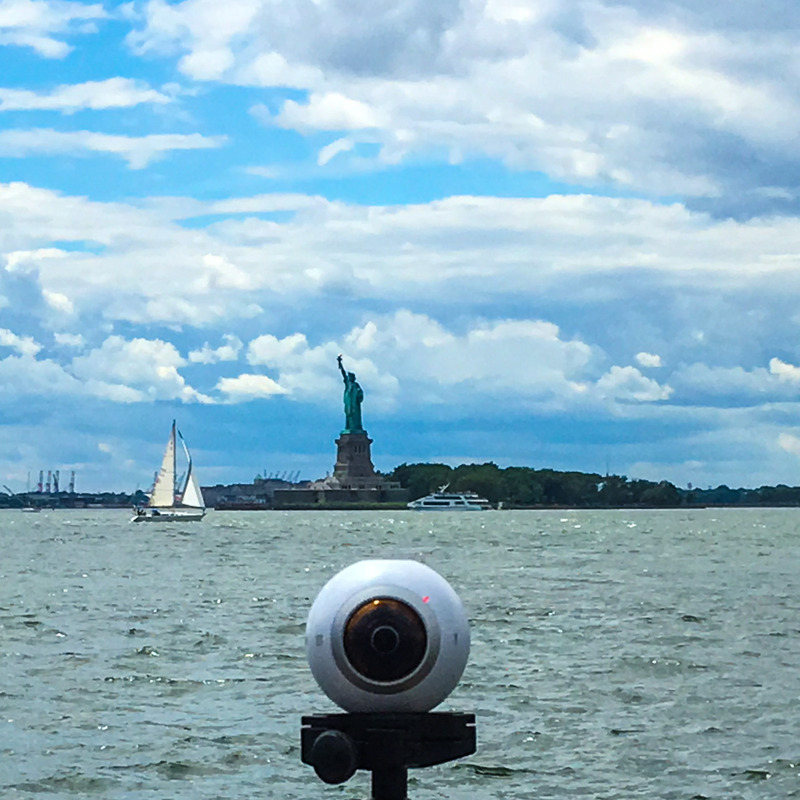 Sure, the five of us did a ton of touristy things, but our main purpose for being in New York was to capture VR footage using a new Samsung Gear 360 camera for The St Giles 360 promotion. More on the promotion a bit later but see if you notice the small, white, sphere-shaped 360º camera in the embedded video (it reminds me a little of BB-8 from Star Wars). It is very well-known to my friends, family and social media followers – I love taking photos while traveling, but my true passion is videography – editing those files and creating something memorable from all of my clips. Heck, I’ll take my camera to a regular dinner out and find a way to make a movie, just ask my wife, Jennifer. Lucky for me, my family and even my closest friends are kind of used to it, by now at least. They know that if Scott is going to be there, they should be prepared to be captured on video. I like that and even though I surely don’t express it enough, I also appreciate their participation. In this post, I’m going to try to take you through our entire experience in New York. First, I’ll dive into my thought process surrounding the embedded video, then I’ll try my best to explain what exactly filming and viewing 360º/VR video is like and lastly share with you the St Giles Hotel experience. You’ll notice throughout the different shot sequences in this video, most of them are grouped and take place at a singular location in and around Manhattan. Then, at some point, a transition in the music occurs and a new scene emerges. This is a common theme in most short videos I create. I am a very linear editor. I typically enjoy a sense of order throughout. 56 Hours in New York City was shot with a variety of different cameras. My iPhone 6s Plus, a GoPro Hero4 Silver and a Canon G7x. All three fit nicely in my pockets. But, I’d say the majority of footage was captured with my Canon (it’s just such a good camera). The slow motion of the birds flying over buildings in TriBeCa was filmed with my iPhone (settings: 1080p, 120fps), and the one scene where you will notice me filming with my GoPro is the sweeping turn looking up at the buildings on 5th Avenue and concluding with the NY Public Library. GoPros maintain a FOV (field of vision) of about 170°. They do an amazing job of capturing big sweeping landscapes and work great with attachments to aide positioning. For this shot, I had it mounted to my LanParte gimbal for extra stability. It might sound like a lot to carry around (and it is), but most of us are already traveling with an smartphone. Adding two additional small cameras is really not a problem at all; they travel easily in my pockets or backpack. Understanding what works best in certain situations, allows me to play on the strengths of each individual camera. Governors Island – a 172 acre island packed with amazing views of Manhattan, food trucks and playgrounds – located in the middle of New York Harbor. The Court Hotel – one of two St Giles properties located on the corner of East 39th Street & Lexington Avenue in the Murray Hill district. Central Park – we spent time racing model sailboats and touring Belvedere Castle, a late 1800s Romanesque and Gothic styled castle – a photographers dream. Lower Hudson River Park – with amazing views of the water and One World Trade, not to mention the interactive playground and mini-golf course. Again, it’s hard to miss the unique 360 camera was in many of the shots, however don’t get this video confused with what you would typically see from a virtual reality/360 video. Totally different. I mentioned at the beginning of this post we were in New York participating in a unique promotion. The St Giles Hotel Group along with creative studio Piranha New York enlisted a select few hotel guests and bloggers in cities around the world where St Giles properties are located. They were asked to share their travel experiences in 360º or Virtual Reality to help bring awareness to the St Giles’ brand. I’m 40 years old (just turned by the way 🙂 ). If you’re anywhere within 5 to 10 years of my age you probably remember the old red View-Master stereoscopes that as a kid you’d drop a circled cardboard disk with 3D images on it into the viewfinder. Then you’d press a button to advance the slide and it “kinda sorta” felt like you could reach out and touch the image you were looking at. That was VR for the 1980s. I’m not sure if 360º video and VR are mutually exclusive, the technology is still so new. Here’s how I interpret it. The new Samsung Gear 360º camera when set up will capture images of everything happening around it in an almost perfect sphere. To view the footage on a platform like Facebook or YouTube, you can take your phone and move it in any direction to view a different perspective. It’s amazing to watch. But Virtual Reality (and I’m not sure why I keep capitalizing it, but it feels better when I do) is the act of immersing yourself into that world via a headset device or something as simple as Google cardboard. Earlier this year, the St Giles Hotel Group embarked on a new marketing strategy titled, “Be Central, Be St Giles“, which has been amplified with the St Giles 360 promotion. I cannot speak for their international locations in the UK, Australia, the Philippines or Malaysia, but their two New York Hotels could not be more centrally located for business travelers or tourists alike. The Court & The Tuscany are located on E. 39th St between Lexington & Park Ave. Staying at either The Tuscany or The Court allows you the freedom to explore Central Park to the north, Lower Manhattan to the south as well as venture to points along the East River or the Hudson quite easily. An added bonus is that Grand Central Station is a short 5 minute walk from both New York properties. “What do you want the St Giles to accomplish in the next year? Tan stated, “I would like to officially launch St Giles as a hotel brand capable of playing on a global stage. I aim to make St Giles a great brand by doing my part in creating a team, family culture and friendly spirit that employees can embody and guests can feel. I believe that our employees are the keepers of the brand, so I try to empower them to give their best with every interaction, every day. I also believe that every guest experience either builds the brand or tarnishes it. I’m currently in the process of creating consistent standards, which can be challenging given that we are a collection of unique, independent hotels. And while we embrace our hotels’ individual personalities and differences, we also strive to make sure that every property has a level of quality and service that meets customers’ expectation. Surely, most hotel CEOs would want their brand to operate and be perceived by their guests in the same way as Ms. Tan describes. However, you and I both know that at times you’ll stay at a nice hotel with a great room, but when reflecting on your stay, you find that there was nothing significant or memorable about the overall experience. Zero brand loyalty was established between you and the hotel; it’s not like you are going to write up a bad review on TripAdvisor or Yelp, it was just another place in a list of many where you have rested your head. Most likely, for your next vacation or business trip, you’ll just go back to Orbitz or Expedia to find somewhere else to stay. I have stayed at both of the St Giles’ New York properties on three separate occasions. The first time was back in 2013, Jennifer and I spent a weekend at The Tuscany. She wrote a blog post about our NYC weekend (please excuse the formatting issue on this 3 year old post). Our second visit took place earlier this year in March when Jennifer, the kids and I decided to drive up to NYC for spring break. You can watch a short video and read the post I wrote chronicling our road trip and stay at The Court. When the opportunity arose for all of us to pack up and head back to the Big Apple, we could not wait to try out the new Samsung technology, stay at The Court Hotel once again and set the stage for the new memories and fun sightseeing adventures that awaited us. I think I can speak for my entire family, but New York City is a place where you could visit once a month for a couple of days and never run out of exciting things to do or experience. In my opinion, Ms. Tan and the St Giles Hotel Group have succeeded in her charge to build the brand by creating a friendly spirit and family culture. My kids were eager to hit up Central Park once again, board a subway at Grand Central Station and gaze upon all of the skyscrapers. However, they were most excited to say hello to a few of the hotel employees like Aamira, Shelby and especially Orlando who helped make their March trip so much fun. The balcony view from room 1214 overlooks the Chrysler Building, but this is better. Spending this past trip collaborating with such amazing people at Piranha New York and The Court Hotel made our 56 hours in New York City one of our best adventures ever. Please follow The St Giles Hotel Group and Piranha on Instagram to keep up-to-date on when the final edit of the 360º/VR campaign will be released.